Apple’s Major 3PM Announcement Tomorrow! 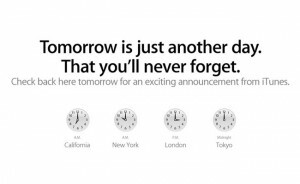 Apple’s website today says that there would be an “exciting announcement” tomorrow at 3pm. Just what this announcement is still a secret but it is clear that it has something to do with the iTunes package. Just this weekend many had updated their iTunes to 10.1 and the iOS 4.2 update for iPad and iPhone 4 is much awaited. The announcement comes to us via an image posted on Apple’s website along with a little teaser that says “exciting announcement” and “that you’ll never forget”. This led to major gossip around the net to guess what this announcement might just be. Many speculate that it is a cloud-based service or a Mac app store. Some guessed that it might be an iTunes Live service, while we here at iTgrunts think it might be Hulu type service offered by iTunes. Hulu Plus announced, support for iPad, iPhone, Xbox! Previous Wireless Headphones for iOS devices from Apple Soon!